Horry County native Kirk Battle has announced the release of his first novel, Space Lawyer, and will celebrate the launch of the science fiction work on Friday, August 16 from 6-8 p.m. at Cowork MYR in Myrtle Beach, S.C. Hard copies of the book will be on sale to attendees for $10, while some Space Lawyer t-shirts will be on sale for $15. Battle, who works as an attorney at Battle Law Firm in Conway, says it took nearly nine months to complete the novel, which he self-published. The 30-year-old earned his bachelor’s degree in English from Tennessee-based Sewanee University before going on to earn his law degree. He’s taught creative writing, and published articles in magazines, blogs and academic journals both under his own name and his pen name, L.B. Jeffries. Battle cites the experience of writing and self-publishing his first novel as both exciting and rewarding. Space Lawyer follows the journey of Lane, an apprentice space lawyer, and takes place in Charleston, S.C., in the future. The novel’s plot delves into modern day themes, including changing gender roles, expansion of social media and video gaming culture, and data collection and monitoring by government entities. In a world where women are in power and men are struggling to find a new identity, apprentice space lawyer Lane is about to find out that change has a heavy price. At a time when the government knows where you are and what you are doing every minute, one of his clients has gone missing. Now it's Lane's job to find her. Caught in a hostile landscape of male alliances and powerful matriarchs, the line between the virtual and the real is becoming harder and harder to identify. When he discovers that his missing client is involved with a faster than light (FTL) travel device, he opens a Pandora's box of conflicting, hidden agendas. And as the case becomes more confusing and reality begins to mirror the virtual world, the future hangs in the balance as Lane fights to solve the mystery and prove his worth as a true space lawyer. The cover of the novel was designed by another Horry County native, André Pope. More information on Space Lawyer and author Kirk Battle can be found online at www.kirkbattle.com. 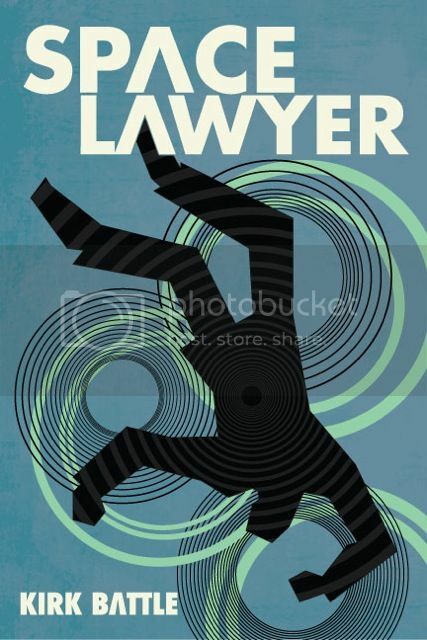 Space Lawyer is currently available for sale online at Amazon.com in both a Kindle version ($4.99) and paperback ($11.99).